With the family Christmas in Glasgow this year, the stage was well set for a good Boxing day walk, and an ascent of Ben Lomond certainly didn't disappoint. The weather was a little inclement, windy and with rain later in the day, so Len and I set off at a cracking pace with the goal being to make the summit and back down before it got too dark. The ascent was fairly hard going owing to the pace and the wind (which tried to knock us off balance at every step), but easy to navigate and offered some tantalising glimpses of the stunning scenery at the southern end of the Munroes. We made the trip up and down in 3 hrs 10 minutes (!) which I consider quite a pace for the 930-odd metres vertical gain to the summit @ 974. There was general agreement not to tell our mothers that, at one point, we were both flat on our bellies (literally, lying down) to avoid being blown off the ridge at the top - after all they'd only fuss..... My only regret was not getting a video of the stones being blown around on the path, but at that point I wasn't getting the iPhone out of it's waterproof bag! The Christmas Day walk was a slightly more sedate stroll around the grounds and gardens of the rather fine Pollock House. There was even a fleeting view of a kingfisher along the river and of course the slightly damp looking highland cattle. To try out part of my Christmas present, I headed out to Surrey to try out route #5 in The Rough Guide to Walks in London & Southeast England - Gomshall and the North Downs. This turned out to be a 2 hr 5 minute walk (no breaks) from Gomshall round Shere and back again. The weather was a bit inclement, but my waterproofs held up alright. 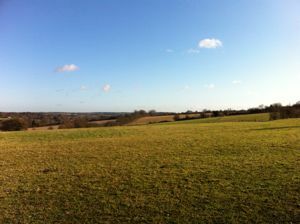 The views from the North Downs Way were a bit disappointing, mostly hidden by trees, but overall it was a good walk. For a bit of a break on New Year's Eve, we headed out for a walk around north London, kindly organised by Helen. We started in Highgate, and after a circuit of Queen's park we headed along the Capital Ring route down to Finsbury. This didn't take as long as the book suggested, but we still deserved a beer at the end. We started in the Eaglet in Finsbury, but were pretty unimpressed with the pub, and instead headed to The Old Dairy for an excellent (and much appreciated) lunch. Getting the New Year off to a good start, Jules and I headed out to Harpenden to try route # 29 in The Rough Guide to Walks in London & Southeast England - Lea Valley Way. This turned out to be a 15.5 km (mostly) circular route starting and finishing in Harpenden. The route heads out to Wheathampstead and loops round the Devil's Dyke before returning to town, partially the same as the route out. Lunch was a perfectly acceptable soup, chips and spicy wings in the Elephant and Castle at Amwell, which seemed to be popular with walkers and dog owners. Overall the route took us slightly over 3 hours of walking, plus an hour for lunch. Rated moderate in the book, we'd agree with about 5/10, considering the muddy conditions underfoot. Hoping for some festive cheer (and not to mention good Gluhwine), Jules and I headed off to Vienna for a long weekend in early December. We had hoped for a bit of snow, and to enjoy the Christmas Markets, but unfortunately the weather wasn't particularly obliging. We persevered for little while in the light drizzle, but pretty soon went inside for a drink in the dry. Overall the weekend was pretty relaxing. We spent some time with Jules' new niece, Paula who could have been more thrilled to see us, not that we take it personally! In fine tradition, Kirsten once again invited us to Denmark, to help celebrate her birthday [no, we're not going to mention which one], and this year Jules, Emma, Jamie and I took advantage of her kind offer. It was a bit of an ungodly hour for the flight, and there was a small amount of drama when we realised that I'd forgotten my driving license (the car rental was in my name), but otherwise we arrived without particular incident and were quickly put to work setting up for the weekend. The format was much the same as previous years, good food, good company and an occasional stroll around the beautiful countryside to build up an appetite (about a dozen steps usually considered quite sufficient). 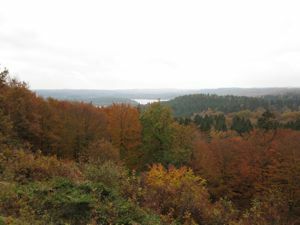 The leaves were turning, and the mixture of evergreens and deciduous trees (which I've not really seen in the UK - we're used to much more homogeneous woods) made for a lovely contrast in the colours. With the tail end of Hurricane Katia heading for the UK, Jules and I decided that the only sensible thing to do was to head up to Glen Coe for a spot of walking in the West Highlands. We caught the sleeper train out of Euston on Friday night, which was a bit cramped for two people, (to be honest you need to be good friends with whomever you're traveling with), but we settled down pretty quickly and slept most of the way to Fort William. The weather was forecast better for Saturday than for the rest of the weekend, so without further ado we set off to have a crack at the Pap of Glencoe (Sgorr na Ciche). This is a 5 mile (plus a couple, owing to where we started), 740 m VG route. We learned to ignore the (mostly useless) 1:25,000 OS map, after a brief detour up to see a dam, and from then we just followed the path/stream which was fairly easy, although a bit boggy in places. We made it to the last saddle, at 600m, just before the final ascent, but with the weather closing in and Jules' waterproof coat proving anything but, we decided that discretion was the better part of valour and came down instead. All in all it was a good wake up call to the realities of walking in the highlands - good equipment and strong legs required, and be prepared to adjust your plans in the face of the weather. In the late afternoon we headed back to Fort William to buy Jules a proper raincoat, then headed back to Clachaig Inn for a very hearty meal before collapsing in bed very early. 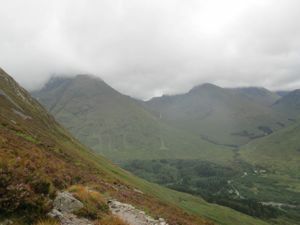 On Sunday, and somewhat better equipped we headed out to try a route in Glen Etive, around the Robber's Waterfall, with an option of heading up to Stob Coir an Albannaich if both we and the conditions were up for it. The route was very boggy for most of the walk, having rained pretty heavily for the last few days on top of a very wet August. 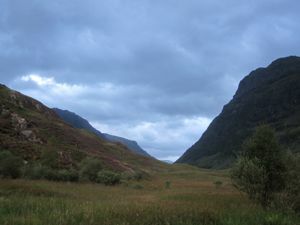 We set off fairly briskly (owing to the midges) and made our way to the bottom of the Allt Mheuran. From there we headed up the East bank of the river - quite hard going on the boggy ground and with pretty steady rain. The plan had been to head up as far as we wanted to go and then to double back and cross over to the West side of the river and back down the far side of the waterfalls. Unfortunately the blustery weather put paid to the former and the heavy rains & streams in spate put paid to the latter. The Allt Mheuran was not fordable where we had intended to cross, and so we headed back down the route we'd come up. All in all the day was about 700 m VG and 7 miles, and took us about 4 hours, but tough and slow going. On Monday after another hearty breakfast we set out to enjoy the best of the highlands weather - you guessed it, rain! 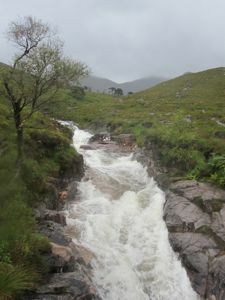 We tried to do a short walk around the Mamore Lodge, above Kinlochleven, but a combination of some shockingly bad navigation on the part of yours truly and swollen streams left us badly off track and pushing through thick bracken up steep slopes. We never made it to the lodge, but instead came back down a slightly different path a bit sodden and with wet feet once again. The most challenging part of the day was the final crossing of the stream - the safest way we could find involved a calf-deep walk through the rushing water, but which fortunately left senses of humour intact. All in all that made the set of 3/3 failures to complete a walk as intended at the outset! 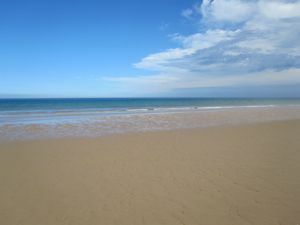 With one anxious eye on the weather forecasts, Andy, Belinda, Jules and I headed out to Norfolk for a weekend walking along the Norfolk Coast Path, including parts of the Peddars Way. 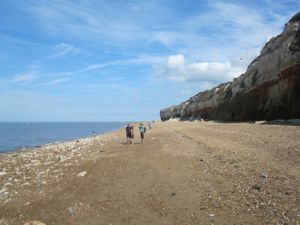 We headed out of town on Saturday morning, catching a fairly quick and easy train to Kings Lynn, and then onto the Coast Hopper to Hunstanton for the start of the walk at about 12:30. We headed out along the beach, round to Old Hunstanton, passing the distinctive white and red cliffs. From there we headed along the dunes next to the beach, which was quite hard going, and there was a little bit of muttering that it'd better get easier later on! We stopped for a quick lunch in Holmes Dunes Nature reserve at about 2pm before carrying on into Thornham for a coffee at the Orange Tree. We then followed the Peddars Way away from the coast, climbing up onto a slight ridge, with excellent views over the sea. The final stretch of the day was the drop down into Brancaster having taken 4 hrs 15 minutes to cover the 10 fairly flat miles including breaks and rests. Overall the weather was bright, clear, dry and warm but not too hot - a perfect day for walking. After a quick shower and freshen up, and with the prospect of a well earned pint in sight, we headed to The Ship Inn. The food was very good (but not cheap) - the oysters were fantastic and we shared a very good pate for starters. After dinner we had planned to take a stroll down to the beach, but in the end discretion proved the better part of valour, and we decided to leave that pleasure for the following morning. In celebration of Ana & Dylan's wedding (and to take advantage of the chance to see the city), Jules and I headed out to Murcia for a long weekend. 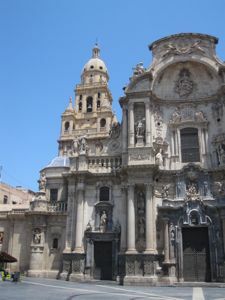 Neither of us had been to Murcia before, which turned out to be a very pretty and thoroughly pleasant city, full of small bars and restaurants (it is Spain, after all), and thankfully not at all overrun with tourists. 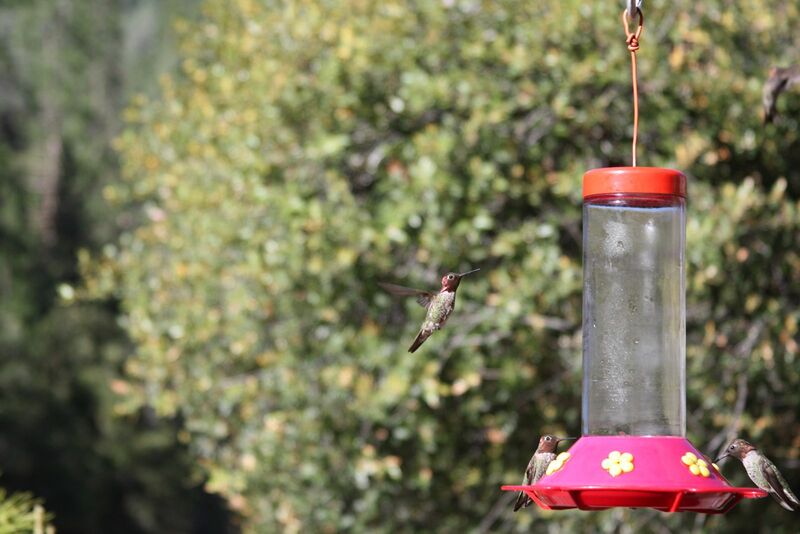 The weather was fantastic, low to mid thirties, with blue skies and fairly typical for the region/season, I believe. We spent a bit of time exploring the city - whilst not otherwise engaged meeting up with old friends and eating and drinking too much. The Cathedral was particularly impressive, as was the Casino which has been restored to its former glory. For our main summer holiday (and the first two week holiday we've taken together) Jules and I headed off to the West Coast of the USA to spend two weeks touring San Francisco, Yosemite, Las Vegas and the Grand Canyon. It had been quite a long time in the planning, as we booked and arranged everything ourselves, but it all paid off in the end. 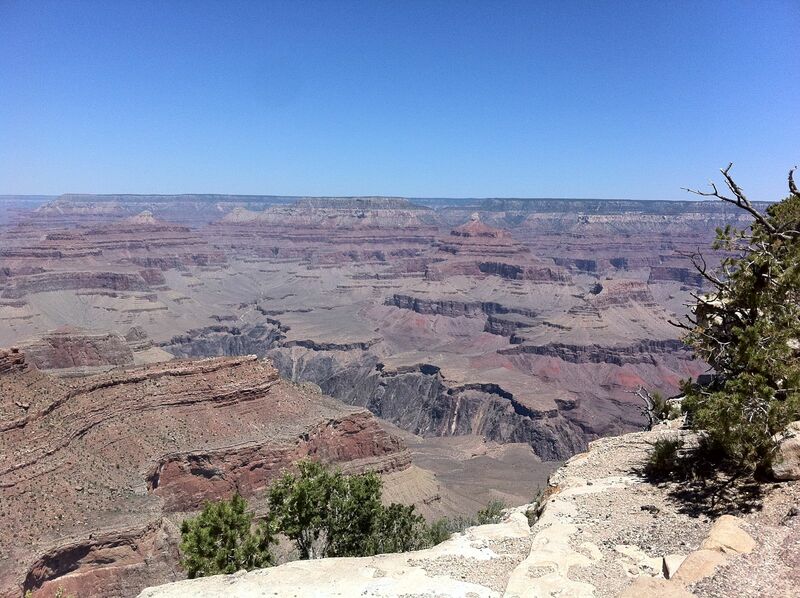 We were particularly impressed with Yosemite (which was fantastic, with the waterfalls in full flood) and the Grand Canyon was spectacular, although very hot. We arrived mid-afternoon and suffering slightly from jet lag we headed down to the waterfront. We had lunch at "Boudin" (famous for baking their own sourdough bread on site) which was a great clam chowder served in a bun, and very spicy and unusual (although very good) Prawn-Marie Salsa which really hit the spot. To get back to the hotel, we walked through China Town and back round the bottom of the Coit Tower before collapsing asleep. We started with a good breakfast in Kuleto's just off Union Square. With the weather hot and sunny, we decided to take a Hop-on Hop-off tour via the Golden Gate Bridge. We got off the bus and walked along the beach-front, with schon warm sand, but very cold water in the bay. I ended up taking lots of photos of the Golden Gate Bridge. Back on the bus to Union Square. We had a huge lunch in Taylor St. Cafe (and not for the last time thought that portions of half the size, but twice the quality would be an improvement). After lunch we went shopping (with Stuart clearly winning the "who can buy more" prize). In the evening we took a ride on the Cable car, and then back up to Little Italy for a drink and a relax. After a monster coffee we went up Coit Tower - which has great views of the Bridge (silhouetted against the sun at that time of the day) Alcatraz, and the rest of San Francisco. For dinner we headed back to China Town for noodles, but no dim-sum. It was a good day for the pedometer, with Jules managing more than 26k steps! 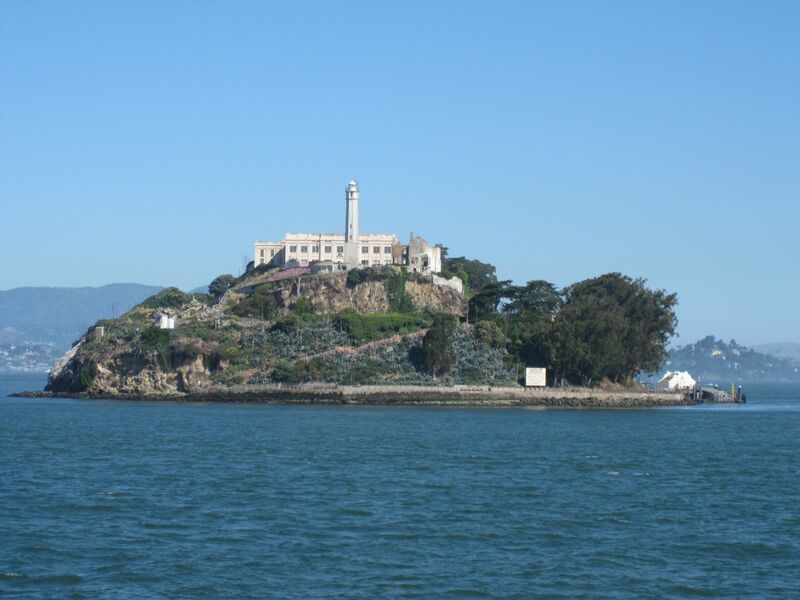 In the morning we took the boat trip out to Alcatraz & the audio tour, which was a fascinating experience and well worth a visit. Once again we were lucky with the weather, which was very warm, bright, and sunny. For lunch we stopped in Fisherman's wharf and having already learned about the size of the portions ordered two starters - which was plenty. 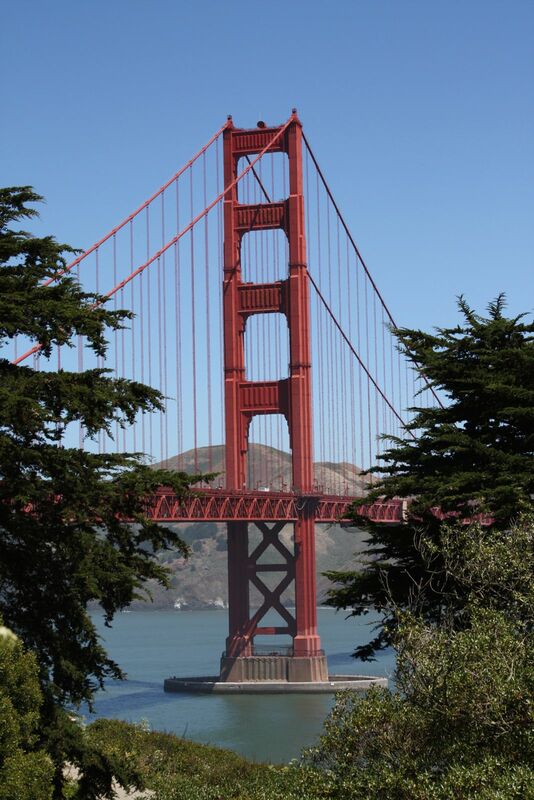 After lunch (and with a brief interlude whilst Jules had fight part II with Barclays to be allowed to take some cash out), we rented a couple of bicycles and rode out over the Golden Gate Bridge. On the way over the bridge we stopped to see either Seals or Sea Otters (we couldn't agree which), and then continued past the main headlands on to Rodeo Beach. It was a bit of a pity that the scenic route was closed, and we had to take a couple of tunnels to get there, but the area was very pleasant when we got there. There were people surfing (definitely in wet suits), and we went for a brief paddle until we worked out how cold the water was. On the way back we stopped at the Beach Cafe for a berry scone (for Jules) & a coffee before dropping the bikes off in town and then walking back up Hyde (which is very steep for the record) to Nook bar for a well earned drink and a snack for dinner - our first sensibly sized portion & good quality meal in the USA! We rode the tram home with Stuart in his Rab jacket, looking ridiculous. After breakfast in Lori's diner, we picked up a car (with NO acceleration) and drove out of San Francisco. We stopped for lunch in Merced, and were both very surprised by the heat (which was well over 35°C), and didn't bode well for walking in Yosemite. There was much confusion caused by "Xing", and it took Jules a little while to work out who "Ped" was! 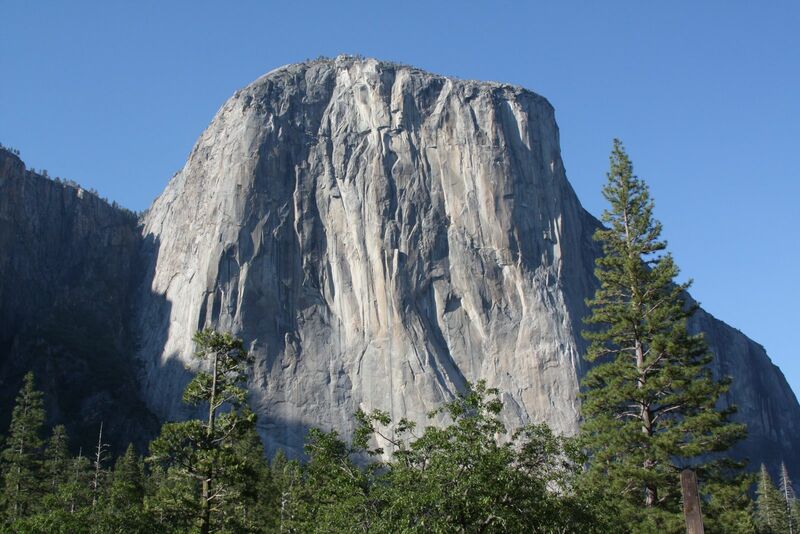 After lunch we continued onto Yosemite passing through some very beautiful countryside of rolling, golden hills of grass outside San Francisco which closer to the foothills of the Rockies became punctuated by green trees, and grey rocks with red lichen. Late afternoon we arrived at the Blue Butterfly B&B - where Liz and Ron showed us to the most beautiful room we've ever had in a B&B, topped off by hummingbirds on the veranda. With the sun beginning to go down we drove into Yosemite for the evening. This was our first sight of El Capitan and Yosemite falls - which were absolutely stunning and the pictures really don't do them justice. For our first full day in Yosemite, we went walking with Ali and Dave, who we met in Blue Butterfly. 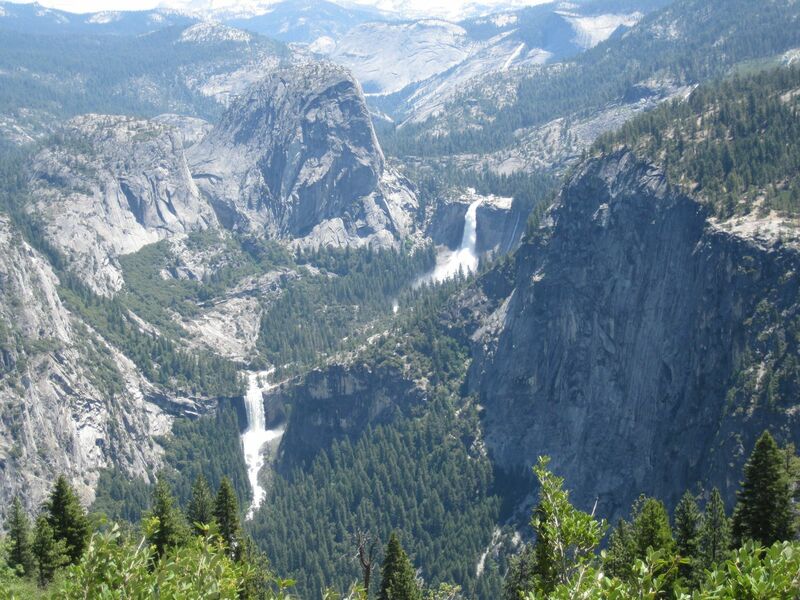 We took the Panorama Trail down from Glacier point, past the Illouette falls, Nevada and Vernal Falls. All the waterfalls were in full flood which, we were told, was the best display in 50 years or so, and awe-inspiring. 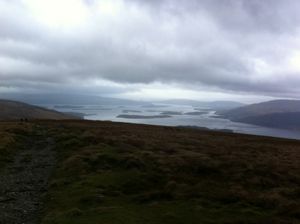 The conditions were good for the walk - it was warm and pleasant and the spectacular views made it a great walk. We got soaked coming down past Vernal falls on the Mist trail - the prize went to those with enough foresight to put on their waterproofs for this section! 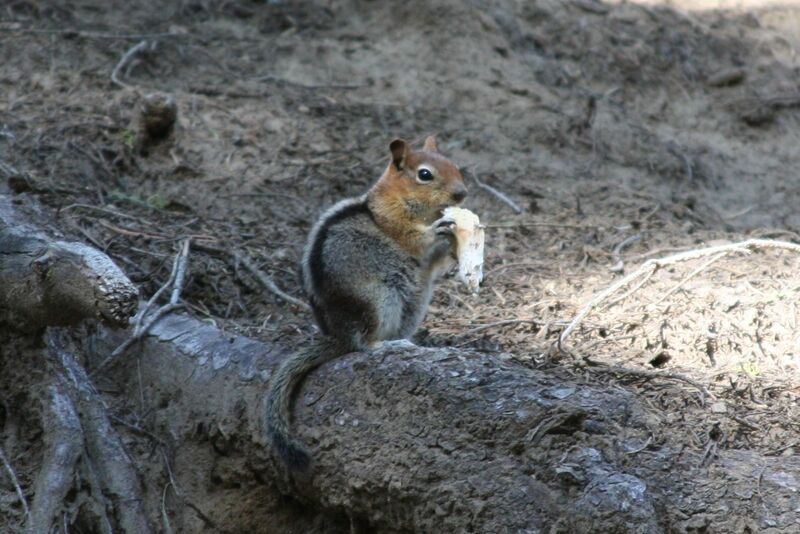 During the walk we saw lots of squirrels, jays, rooks, and on the way back up to Glacier Point we saw two bears and a coyote. It was a great walk, but quite tough (especially considering it was all down hill) and our legs were definitely feeling the strain in the evening and on Friday. It was a day of walking with Giants - Sequoias. We started with Merced Grove, which is meant to be the quietest and least frequented. 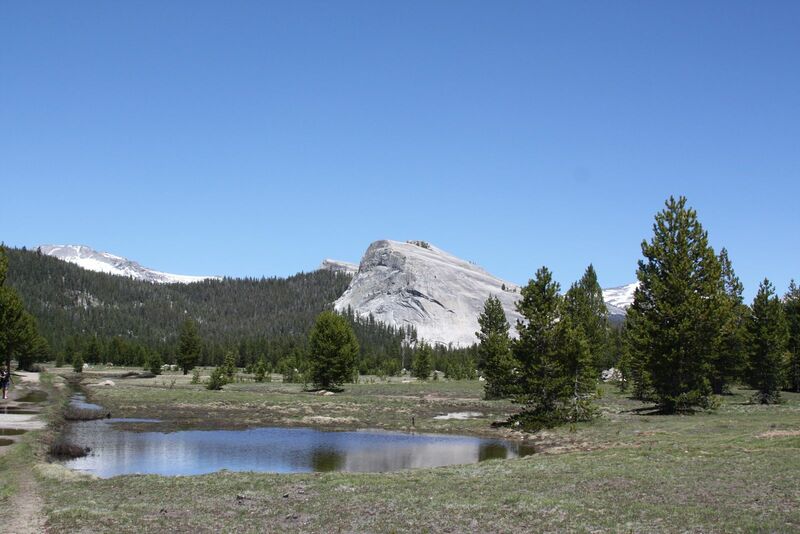 We then drove up the Tioga Road to Tuolumne meadows intending to have lunch followed by a slight sense of humour failure when all the shops and restaurants closed, but we made do with a nice lunch of grapes and some water. After "lunch" we went for a very brisk walk to the Soda spring (pursued by, and swatting off mosquitoes all the way). The meadows were very pretty and well framed by mountains, and with a bit more time (and bug spray) it would have been good to stay for longer. Afterwards we headed back to Crane Flats for a late lunch and then took a slow stroll around Tuolumne Grove of Sequoias. On the way back up we saw a little fattie who obliged us by staying still enough for a couple of photos. It was a good relaxing day for our legs, although we did clock up quite a few miles overall. 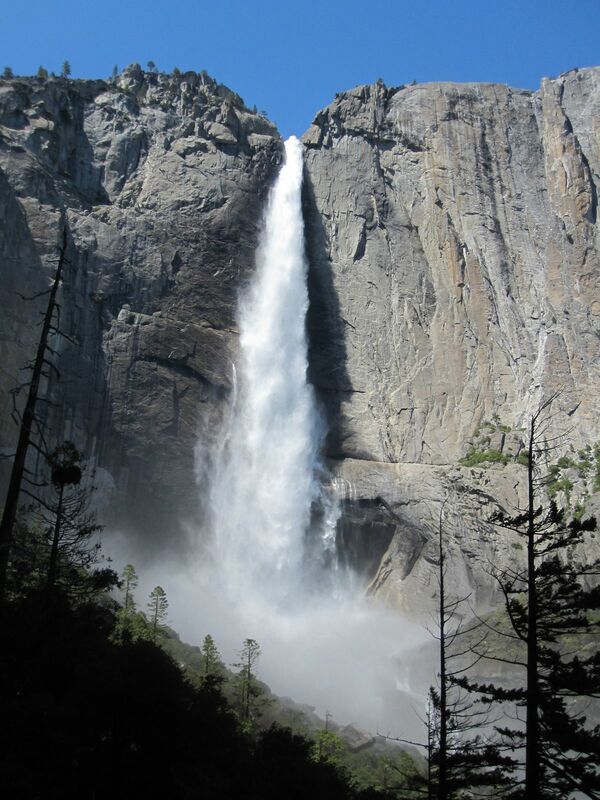 For our second big walk in Yosemite we took the Upper Yosemite Falls Trail. This turned out to be about 3.4 miles each way (up and down - it's a linear trail), with VG 835m, and very tough. We took breaks at the 30 & 90 minute point, and in total the assent took 2 hrs 20. We took a long-ish break at the top for lunch and to relax and enjoy the view. Our descent was not much faster than the ascent, at 1hr 45, with a total for the round trip 5hrs 15 minutes. 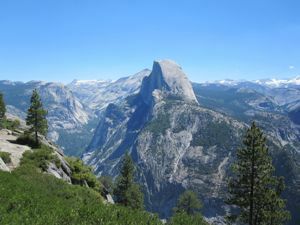 The route has spectacular views of the valley, Half-Dome and the Upper Yosemite Falls at the half way point. We saw Jays and two types of lizard (one with an orange neck). Liz's trick with of taking frozen water bottles worked really well again (very cool and refreshing). We (actually Stuart, if we're honest) got a bit pissed off waiting for the shuttle bus to take us back to the car park, so we ended up walking back. Overall it was a great day, although the toughest 3 mile walk we've ever done! Comedy value for the day way provided in the evening by the fly screen in the room - with both of us walking into it at some point, much to the amusement of the other! Sunday - Travel to Las Vegas. After a chilled out Breakfast, and with some considerable regret, we packed up from Yosemite and drove back to San Francisco, which took us about 5.5 hours, (don't believe anyone who tells you it's less), although we did stop for the biggest "appetizer" I've ever had at the Espana Canal House in Los Banos. We caught a late flight to Las Vegas, and checked into the Palazzo, having been upgraded to the biggest hotel suite we've ever stayed in. Seriously, this place was huge, two bathrooms, a separate living room and three built in wardrobes, you could quite happily live in this "room"! After a decent night sleep, we headed out in the morning to explore Las Vegas - we walked down the strip in the mid-morning (which was very hot). In the afternoon we chilled out in the room and by the pool. In the evening we went out to the strip to look at the lights, and drank frozen margaritas out of plastic cups in front of Cesar's Palace, in the "Spanish Steps" bar, which probably summed up Vegas for both of us! On Tuesday we drove to the Grand Canyon. We stopped briefly at the Hoover Dam, but the heat was so intense that we didn't stay much longer than it took to see the structure and take a couple of pictures (and we probably found Jules' comfortable temperature limit). Overall the journey was fairly easy and uneventful and we arrived late afternoon and checked into the Bright Angel Lodge. This turned out to be a very cute and well furnished log cabin, complete with all the amenities a walker needs (including a fridge, which was very useful). After dumping our bags we took our first look at the Grand Canyon (absolutely stunning, of course) and went for a stroll along the rim path which was a nice antidote for a day sat in the car. We saw an Elk in the camp area, and bought the general accoutrements including maps food and bandannas for Wednesday. 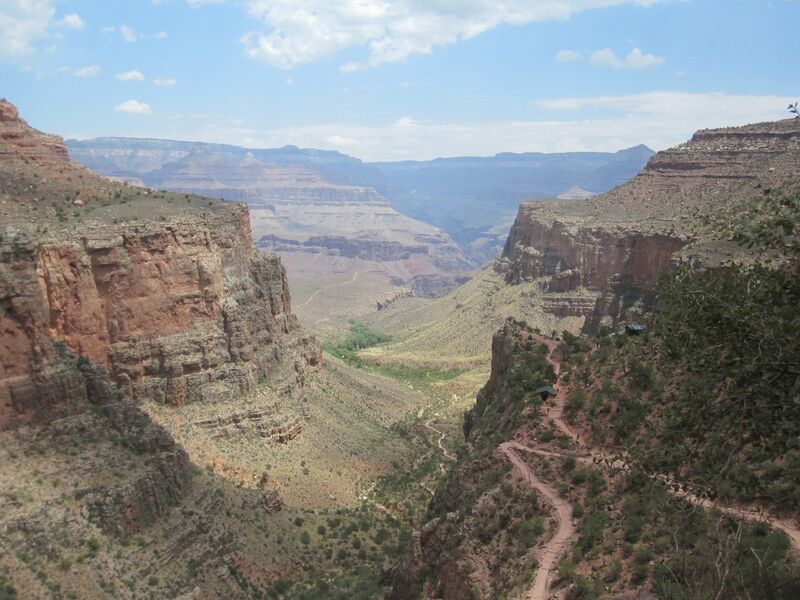 For an experience of the Canyon, we walked the Bright Angel Trail down to the 3 mile point. This was a very tough walk, it took us 45 minutes to get down to the 1.5 mile point, where we rested and re-hydrated and the Ranger tried to persuade us not to carry on, but to turn back. It then took us another 50 minutes to get down to the 3 mile point where we had a good long rest and recuperation for lunch. One of the challenges (I'm told) is that the human body can only absorb about a litre of water an hour, and you're losing far more than that whilst walking, so you actually need to stop and sit in the shade for long enough to rehydrate, no matter how much you're drinking. After lunch we headed back up to the 1.5 mile point, which took use 1hr 5 minutes, and then 55 minutes back to the trail head. We both felt quite knackered afterwards, even stopping for 5 minutes every 20 on the way up. Overall for the round trip we took from 9:20 am to 3:25pm, and for me it was the toughest walk I've ever done - a combination of the altitude and the heat. We saw lots of fat squirrels and lizards and of course there were fantastic views of the Canyon. In the evening we took a (small) bottle of champagne to Hopi point to watch the sunset, which was absolutely stunning and a bit of a highlight of the trip. For dinner we made a good stab at the 10 piece chicken meal (which I think included about 6 half-chickens, plus legs), but ended up saving enough for lunch the next day! 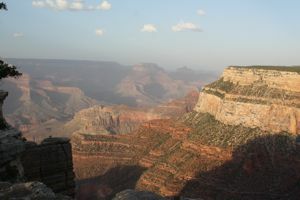 For our last day in the Grand Canyon, we took a walk along the rim trail to Yakapi point . It was a good day, with great visibility and views out over the canyon. After lunch we began the drive back to :Las Vegas, stopping off in Red Rock Canyon (Ron's suggestion) on route. Aside from being a great antidote to long drive in the car, the canyon is pretty impressive in its own right. We didn't climb Turtle Head (we're leaving that for next time), but we did have a good stroll around some of the flat areas of the canyon. 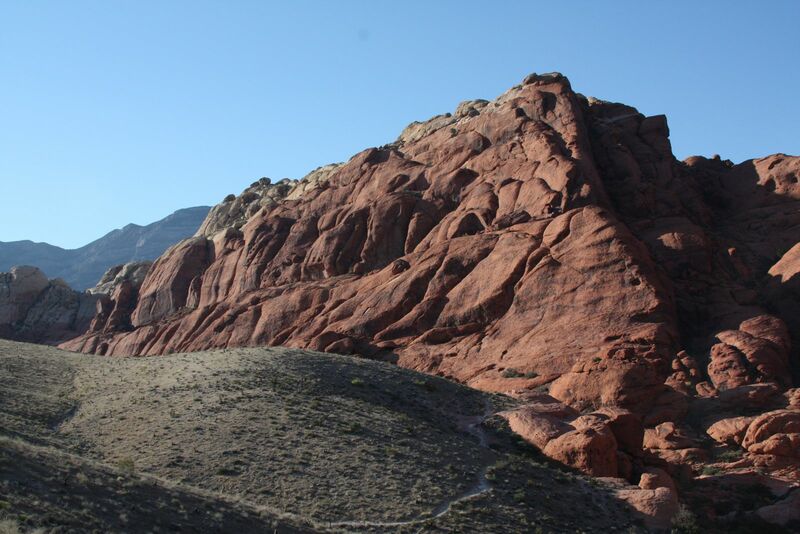 I believe there's good climbing here (at least one 5.8+ route) and the very striking red sandstone rock formations are particularly impressive as the sun sets over them. Rest day in Las Vegas. Stuart chilled out in the hotel, and watched far too many episodes of Law & Order whilst Jules went shopping, and later went to the pool. Saturday - Leaving Las Vegas & Traveling Home. We checked out and left our (lovely) room at the Palazzo and wandered through the MGM Grand. We had intended to take a Hop-on Hop-off bus tour, but since it was quite pricey and only went up and down the strip (which we'd seen a couple of times already) we did the CSI Experience instead (which was quite good fun, if a little cheesy). It was another scorching day in Vegas (well over 40 °C in the sun) so we were trying to stay indoors as much as possible. We were slightly disappointed at the airport, as the last bar closed at 7:45 and all the shops closed at 8pm, so a bit boring waiting for our flight. The 2011 installment of the Fat Boys on Tour was once again superbly organized by Slick. The destination this year was Tallinn, Estonia, which proved to have sufficient quantities of Pork products and Beer to keep both the Major and Jim happy, and as we all know, well fed Fat Boys are happy Fat Boys. There was the requisite amount of sightseeing (a stroll to the local castle/church/pub being considered quite sufficient to build up a good appetite for the rest of the weekend), and plenty of history to keep everyone entertained. 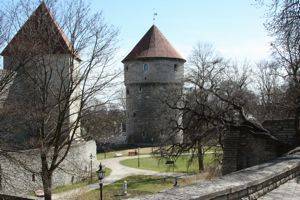 Tallinn proved to be a very picturesque city, and we were well located near the middle of the old town. 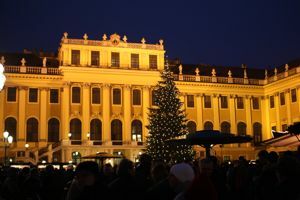 We spent most of the time in the area around the old town square, and found the four days we were there about the right length of time to see everything noteworthy without getting bored. We arrived early on Thursday, and spent the early part of the afternoon recovering from the flight with food and beer (poor Jim had practically died of dehydration during the flight, and the Major was getting tetchy with hunger). We quickly learned about the size of the portions of food, having mistaken the first of the plates to arrive as actually being a portion for three! This pretty much set the scene for the weekend. We were impressed with the Ham Hock in the The Beer House (http://www.beerhouse.ee) and the breakfast in Hell Hunt (http://www.hellhunt.ee) Tallinn's oldest pub. Slick particularly enjoyed the Depeche Mode bar, and yes, that is actually a bar devoted to the 80's rock group, complete with pictures and videos playing almost continuously. We found the beers a little pricey in the bars surrounding the square, but worth it on balance to be able to sit in the sun and enjoy the view, watching the world go by. For our first proper vacation together in 2011, Jules and I headed off to Barcelona for a long weekend (Jules very kindly bought me this trip as a Christmas present, and we've been looking forward to it for ages). All in all, it was a pretty spectacular success. The weather was great, the hotel (Hotel Soho) was wonderful, and the city was great. Best of all it was a chance for us to enjoy a weekend away, and to spend some time together, at the end of a tough first quarter of the year. We arrived at about lunchtime on Saturday and after taking the Aerobus (cost just over €5, runs every 5 minutes and takes 25 minutes to get to the centre of town) to the hotel and checking in, we headed out to find our way about. 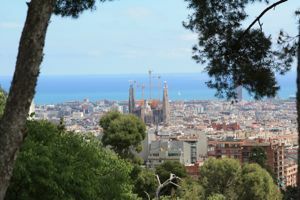 We headed off to the Park Guell (laid out, and with features designed by Gaudi), pressing through the crowds out celebrating Saint Jordi's day. We spent the best part of the afternoon wandering around the park before heading back. In the evening we strolled (pushed our way) down La Rambla, before giving up on the crowds and heading off to a little Tapas place at the bottom corner of Rambla del Raval. In the evening we had intended to go out to eat in Barcelonetta, but couldn't find anywhere we particularly fancied (I refuse to eat anywhere where the menu is first in English), and ended up in another little Tapas bar in the Gothic quarter. On Monday we headed back up to Montjuic, and took a slightly longer look at the Museu Nacional d'Art, which included sitting on the steps, listening to the guitarist, and watching the dancing pigeon (videos on request), and also a quick look round the Olympic stadium, and a ride up the Teleferic to get to the Castell at the top. We headed down for a rather good lunch in a Pulperia (NAME), with Jules trying out her luck in ordering different types of shellfish in Spanish, with ... interesting ... results. In the afternoon, we strolled around Port Vell, and the waterfront, before heading back via the Gothic quarter. In the evening we headed to a local Tapas bar, the final decision being swung by the sign for "Churros amb Xcoloata", which Jules reliably informs me were excellent! 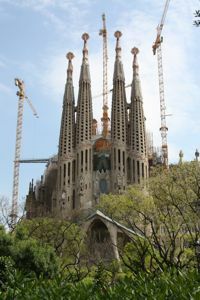 On Tuesday, before our mid-afternoon flight we went back to the Segrada Familia to get a better look at Gaudi's great work. The weather was lovely and we had a good stroll there and managed to get some good photographs before heading back for a bite of lunch and heading to the airport. The trip back was as uneventful and as stress free as the way in, which was a lovely end to a great trip. All in all, we thoroughly enjoyed the city, and would heartily recommend it. We found the city to be fascinating, with plenty to fill a dozen trips, the service excellent, the public amenities very good (how come the Spanish can run a better tube network than TFL? ), and the prices, assuming you stay out of the obviously up market or touristy places, pretty reasonable. With the snow a little sparse in Europe, Andy and I headed off to Whistler for a 10 day trip to enjoy the great season that Canada was having. It's a long journey there, even with direct flights (and even longer with a stopover in Toronto, as we did on the way back) but well worth the trip, with more powder than we knew what to do with! We spent more time on Blackcomb mountain than Whistler, and found some great areas under Glacier Express lift, through the trees to the right of 'Everglades' in 7th Heaven, and in Symphony Ampitheatre. Our favourite runs were 'Outer Limits' / 'Arthur's choice' (two great gladed runs), Ruby Bowl/Sapphire Bowl, 'Cockalorum', 'Jersey Cream Wall' and the Creek in Symphony for a bit of a laugh. The other key things we learned about skiing in Whistler are to check the freezing levels in the morning - the base is low and the vertical gain large over the mountain, so it's possible to stay about the slush. Also the cloud seems to be stratified - if the visibility is bad at one level, try another. Sunshine higher up the mountain, snow and cloud on lower slopes. 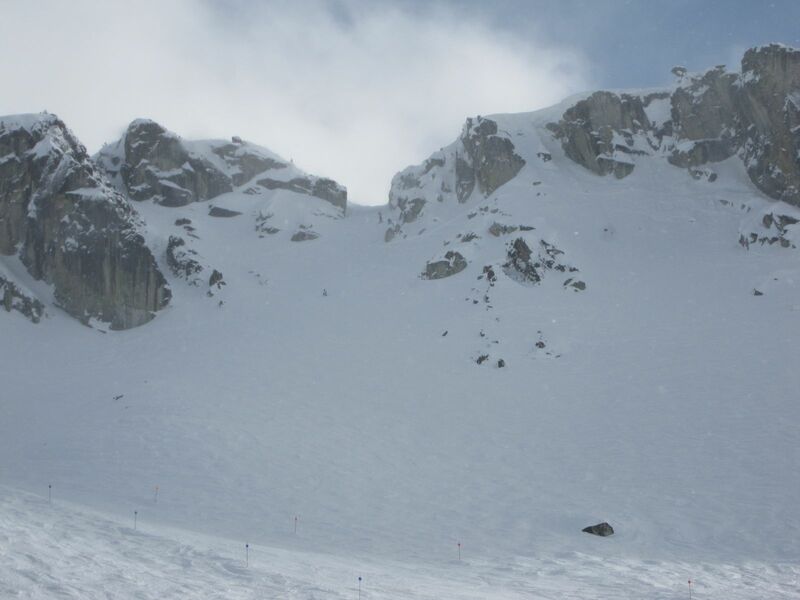 Spent the day on Blackcomb, starting with a few runs around Jersey Cream lift, including 'Jersey Cream Wall (the Run Of The Day, with beautiful snow and a great warm of). A couple of runs under Glacier Express, then up to Rendezvous restaurant for lunch. In the afternoon we headed over to 7th Heaven, starting out with a good but exhausting run down under the lift, that finishes on 'Sunburn', then a cruise down 'Green Line' which turned into a good run down 'Raptors Ride' (good for tight fast turns between the trees) before dropping down to town. One last lift and go-around Jersey Cream to finish, collecting Andy's rucksack clip from where he left it on Solar Coaster Express, to finish a very good but exhausting day. Feeling our legs a bit from Thursday, we took a s gentle run up to Harmony and had a couple of great powder runs under and off the (skiers) left of Harmony Express. Then headed over to Symphony for some more great fun on powder and through tree (including a run along the bottom of the creek). My ROTD was just off 'Adagio' - a very steep run on good snow, but the drop down to 'Sun Bowl' was also a strong contender. Lunch in the Round House - got carried away and ate a bit too much, then spent the afternoon playing under Big Red Express in the trees up high, and then doing 'Franz', 'Wild Card', 'Jimmy's Joker', and Andy's ROTD - unnamed under the bottom section of Big Red Express, accessed from 'Pony Trail'. A great day for powder skiing and back bowls - the skis did well - feet together and they stay up nicely in powder. The weather was a bit blowy on top, overcast, but mostly good light. Occasional snow showers. Failed to meet up with Mark in the morning, and with Stuart bitchin' and moanin' about a headache and sore legs, we headed up to 7th Heaven to try to take advantage of the fresh powder up there. Fair to say that the mind was willing, but the 3rd day legs were not! Beautiful conditions, great powder (although the first run down 'Sunburn' turned out to be a lot more bumpy than expected). A few good runs down by 'Everglades' and one continuing down to 'Where's Joe' before the area got too busy. A long (and very good, although not cheap) lunch in Christine's Restaurant in Rendezvous followed by a couple of runs down under Glacier Express near 'The Bite' a bit cloudy at the top, but thinning out about half way down the run. We finished with a run down 'Espresso' before retiring to The Black Pub for a pitcher (or two) of Ale. ROTD - somewhere near 'Everglades', lost in the trees. 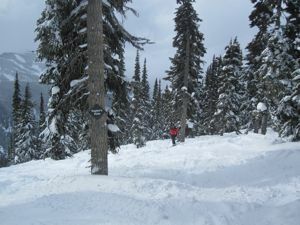 Sunny and occasional clouds and snow started with a gladed run near 'Everglades' then once down 'Cloud Nine' and one more off to the left of 7th Heaven Express which ended up through some very dense trees - a bit of adventure getting to Expressway. Then over into Horstman Glacier, twice down the fantastic face then up the showcase T bar and top to bottom for lunch in the Old Spaghetti Factory (my salad was fine, but Andy wasn't very impressed with his salad. After lunch up to Whistler peak, and down into Whistler Bowl, great fun, good snow although a bit bumpy. Down over West Ridge, then back up to the peak, and down 'Cockalorum' - there was a bit cornice, and an intimidating drop in. 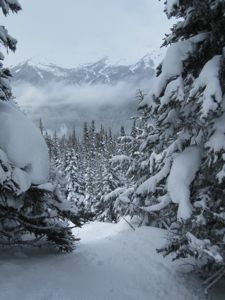 Then through the bottom of 'Bagel Bowl' and down 'Peak to Creek' to Creekside and up Creekside Gondola & back to Whistler. ROTD Horstman's T-bar face, off the ledge. Ski Club of Great Britain with Toby leading. Started under Glacier Express, for a warm up, then up Spanky's ladder. Dropped into Sapphire Bowl, via the lower entrance (past the first cliff marker, but definitely not past the second) - great snow, down 'Zut Zut', then up Excelerator, down 'Couloir Extreme' (great, but tough) then back up to Secret Bowl and down Pakalolo and between 'Staircase' & 'Blowdown' and down into Ruby Bowl, down Playland (great, steep with great snow), the up to Horstman T-bar and down Coyote Chutes & down between 'Staircase' & ' Blowdown'. I gave up at this point, Andy and Ray carried on. ROTD for Andy & Ray - 'Outer Limits', for me 'Couloir Extreme', and 'Zut Zut' for Ed. A fantastic day, Toby did a great job of leading, and we went places we wouldn't have gone without a guide. A bit of a relaxing day after the exertions of Monday, we spent the day on Blackcomb, mostly on piste. Warm up under Excelerator, then met up with Ray's friend, Paul, and went up to the top of Showcase T-bar and followed 'Showcase', 'Blue line' and 'White Light' to Crystal Chair, then down to 'Outer Limits' - great fun, double diamond through burnt out pines to rejoin Excelerator. We then went up to 7th Heaven, and had a couple of good runs on Cloud Nine, before stopping for lunch in Horstman's Hut - good Goulash stew and 'Lagerjug' Sausage. After lunch one more run down 'Cloud Nine', then 'Sunset Boulevard', 'Pruned Paradise' and down under Wizard Express to the lift. Up to the top of 'Glacier Express' looking for good visibility, out the clouds - Cloudy up high, and at low/mid level. ROTD definitely 'Outer Limits'. Windy and snowing for most of the day - snow conditions quite wet and slushy lower down - tops closed of the day owing to winds. Started out up Whistler with a couple of runs to the left of Big Red Run, but decided to head over to Blackcomb as it was a bit busy. A couple of runs under Jersey Cream (great snow, cutting left off 'Jersey Cream'_ one run down 'Arthur's Choice' (great) and one tough run down 'Blue Line' in deep snow and low visibility. Lunch in Glacier Creek Lodge - brought forward slightly by Andy's wet arse, owing to a leaking Camel Pak! Met a 3 year old on the lift who said it was his second season! Also saw a boarder doing an insane route (must have averaged over 75°, but mostly cliff face) down onto 'Blackcomb Glacier Road'. After lunch some runs around Glacier Express, Jersey Cream & Excelerator, including 'Outer Limits'. Finished up with a very late lift up Glacier Express and down Heavenly Basin to a cruise home. ROTD - Powder off left of Jersey Cream. Started up 7th Heaven 0 not open on Thursday and with about 3" of powder on the slopes. 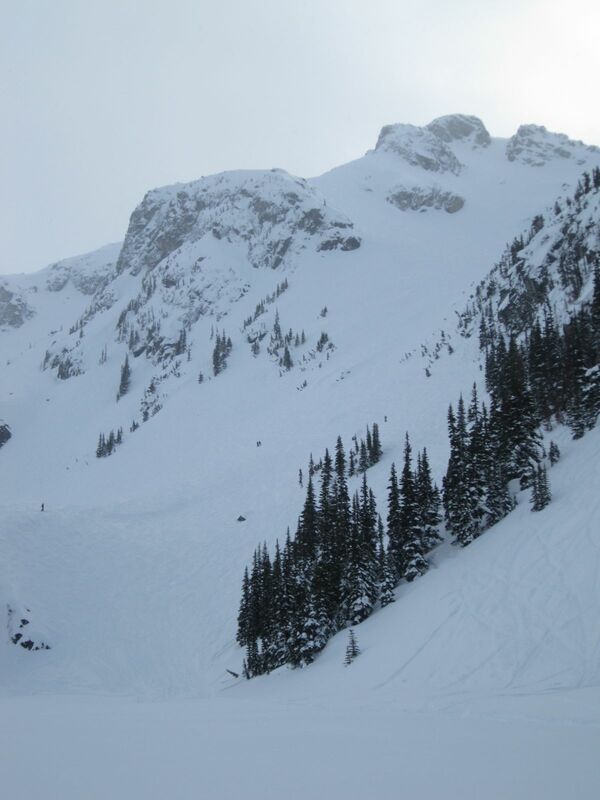 Two runs down to the right of 'Everglades' (too tough for me) then when 7th Heaven got too busy we headed over to the Glacier Creek Lodge (including a rum & hot chocolate which sorted me right out), then a couple of great runs under Glacier Express - dropping into Heavenly Basin. Great snow on 'The Bite' and 'Glacier Drive', then up and over Spanky's Ladder. Fantastic snow in Ruby Bowl - definitely the best run of the day. Up and one more run down 'Jersey Cream Wall' before a long cruise down through cloud to get home. Start of mid-term vacations in Canada ( Saturday + top of mountain closed = very busy on the lifts. Did a few runs under Jersey Cream, snow good, but queues awful, and not really feeling it. Glacier Express did open at about 11:3o, but literally 00's of people waiting to get up there. Spanky's Ladder not open. Took Peak 2 Peak across to Whistler (mostly to have done it) after lunch, then skied down (wet and slushy at the bottom) to finish a great holiday. 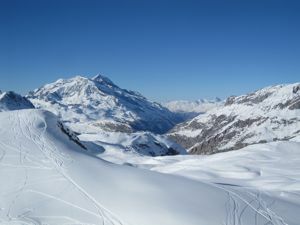 The winter 10/11 season started with a trip to Tignes, with Andy, Bei, Stefan, Lillian & Priesty. The snow was in better condition than we expected, and there was plenty of fun to be had off to the sides of the pistes. The weather was fantastic all week, with bright blue skies, and temperatures between -5°C and -10°C. We found three really good areas in which to spend our time, the first was up at Grande Motte, an area off the side of 'Leisse' (the run), underneath the Leisse chair. The second area was underneath the Glacier Express lift above Val d'Isere, and the third was under the Cugnai lift, also above Val d'Isere. The only disadvantage of the last two is the journey over to Val, but with La Folle Douce to look forward to on the way back, it wasn't too much of a hardship! Took the first lifts to up to the Glacier (Grande Motte), which turned out to be a good plan as the area was pretty empty. Enjoyed 'Descent' & 'Leisse' (black), and then down Genepy which was quite boring so we took the ungroomed black Envers de Campanules down to Val Cloret this wasn't a particularly good idea since the snow was slushy/refrozen with a tricky descent into a long flat valley. We had lunch at Taverne des Neiges in Val Cloret, which served perfectly reasonable food at a fair price with good service. After lunch we went around the top-right hand side of Tignes, on Grattalu, Signal, Grand Huit & Aguille Percee lifts. Again, took the first lifts up to Grande Motte, then spent a while enjoying the off-piste area to the left of Leisse, which was great fun. Afterwards we went down 'Double M' - which provoked slightly mixed feelings in the group, great for the extreme carver, a bit icy for Stefan. Then we headed over to Val d'Isere, which included going down a VERY icy la Face (not much fun). We ate lunch in a Tex/Mex bar in Val, which served a great salad, accompanied by a huge portion of chips! After lunch we headed up to the area near the "Glacier Express" lift and spent some time skiing the off-piste sections next to 'Leissieres' run - this was great fun, and one of the really good areas that we discovered. We headed for home down 'Plan'/'Piste M'/'OK' then Cetes/Combe Folle before dropping down Trolles and up Chaudannes. We took Epilobes home, which was covered in frozen bumps, and not much fun. For a bit of a change, we headed up to top of Val d'Isere, to the Ski D'ete area. We had to leave the extreme carver behind as he went back to get his impact shorts. On the way up to the top of the Val d'Isere glacier, Bei had a slight sense of humour failure going up the long button "Col". We had a couple of good runs off-piste under Cascade express, which had a couple of areas of bumps, but wasn't tracked out. This would have been a good area to come back to, had it not been so far from Tignes. For lunch we headed down to Signal restaurant, at the bottom of the Vallon de l'Iseran bubble for a rather fine lunch. Lamb shanks were the choice for most of the crew, unfortunately not realizing we were to have lamb shanks for dinner! Feeling rather full after lunch we headed back over "Leissieres Express" chair and had a couple of really good runs off-piste under Cugnai lift (another great area that we found and went back to over the course of the week). We then headed back to Tignes down Rhone Alps, which was horrid with hard-packed snow, and where I fell on my backside and slid for about 15 yards, all at about 1 mph. 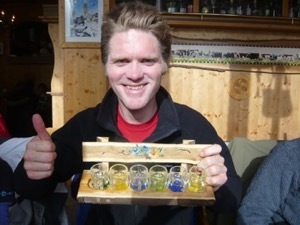 We then headed up Chaudammes for a Chocolat Rhum before heading back to the Chalet. Similarly to Tuesday, we headed for Val d'Isere straight away, to spend some more quality time off-piste under Datcha and Cugnai lifts. By this time we had Priesty's video camera set up and working, and we spent a few runs getting footage of everyone. We had lunch at the barbecue restaurant at the bottom of "Madeline Express" lift. 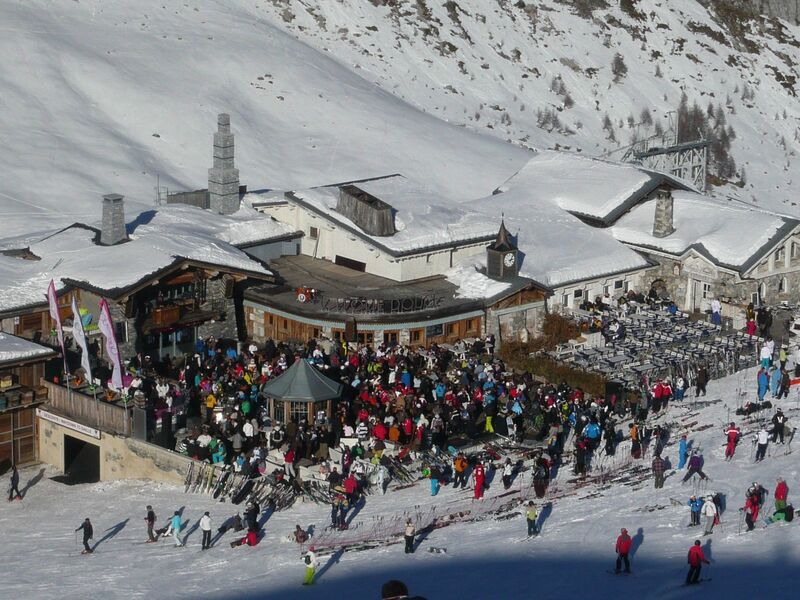 After lunch we headed back to Cugnai for some more off-piste skiing then with the afternoon coming to a close we headed back to La Folle Douce for a bit of a dance and a drink before heading back over to the Tignes side. For starters we headed up to the Grande Motte, to spend some more time off-piste under "Leisse". This was great fun, and we got some great videos, including a classic "I'm trying too hard for the camera" fall by Andy! Some of the footage of us tacking moguls were slightly hampered by Stefan's excellent recording of the snow right in front of him, not having realized that the camera had been knocked out of alignment by a fall. We had lunch back at Taverne des Nieges in Val Cloret, and the started the afternoon with a run under Col des Ves which was very cold, bumpy and not much fun. We then headed off-piste under "Merles" lift - the very steep section, which had great snow. The extreme carver took a straight ahead (rather than a hard cut right) and had a bit of a sense-of-humour failure walk up to the lift. 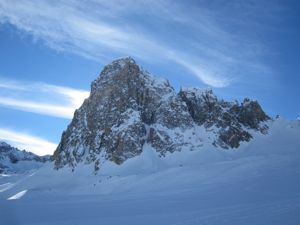 Then one last circuit round behind Merles to meet up with Centauree - great snow. Friday - Day 6 - Priesty's Birthday! The worst weather of the week, and even then it wasn't too bad. Quite cold and windy, especially up at the glacier (the cable car up to Grande Motte was closed). We did a couple of good runs under Leisse, then a trip round the back of Merles before a long and lazy lunch at Pepe 2000 in Val Cloret. There was some discussion over Bei's controversial decision to include tomato ketchup in the Steak Tartare, but it didn't stop us enjoying it. Huge salads to start, and then very respectable main courses, and Genepy (the drink, not the run) to finish. We managed to lose Bei's board on the way down to La Folle Douce, which resulted in a lot of effort to retrieve! To finish a couple of beers in La Folle Douce, then back over to Tignes to Loop Bar. Stefan and Richard narrowly managed to avoid betting lot of money over who won the time trial in the 2010 TDF. Exhausted, but happy, we went back to the chalet, where Richard fell asleep (not un-molested) before dinner. We had a pretty sensible evening before our 5am start back on Saturday morning.